The long title for this post is: “Optimizing 19th Century Typewriters using 20th Century Code in the 21st Century”. What’s the best way to arrange the letters on the strip? You probably want to do it in such a way that you have to shift left and right as little as possible. If consecutive letters in the words you’re typing are close together on the strip, you will minimize shifting and type faster. Swap them and repeat until you can no longer find an improving swap. This is a strong approach that leads to the same locally optimal arrangements, even when you start from very different initial orderings. It turns out that this is an instance of a more general optimization problem with an interesting history: quadratic assignment problems. I will explain what those are in a moment. The letter that I want to type in next, e.g. if I am trying to type THE and I am on “T”, “H” comes next. The location of the next letter, relative to the current one T. For example, if H is immediately to the left of T, then the location is one shift away. A frequency matrix F. The entry in row R and column C is a count of how often letter R precedes letter C. If I encounter the word “THE” in my test set, then I will add 1 to F(“T”, “H”) and 1 to F(“H”, “E”). A distance matrix D. The entry in row X and column Y is the number of shifts between positions X and Y on the letter strip. For example, D(X, X+1) = 1 since position X is next to position X+1. The distance matrix D is simple: if position 0 is the extreme left of the strip and 25 the extreme right, d_ij = abs(i – j). The total number of shifts is obtained by summing f_ij * d_p(i),p(j) for all i and j, where letter i is assigned to location p(i). Our problem boils down to finding a permutation that minimizes this matrix multiplication. Since the cost depends on the product of two matrices, this is referred to as a Quadratic Assignment Problem (QAP). In fact, problems very similar to this one are part of the standard test suite of problems for QAP researchers, called “QAPLIB“. The so-called “bur” problems have similar flow matrices but different distance matrices. Heuristic techniques that often provide good results, but no guarantees on “best”. QAP is NP-hard, so finding provably optimal solutions is challenging. One approach for finding optimal solutions, called “branch and bound”, boils down to dividing and conquering by making partial assignments, solving less challenging versions of these problems, and pruning away assignments that cannot possibly lead to better solutions. I have written about this topic before. If you like allegories, try this post. If you prefer more details, try my PhD thesis. The typewriter problem is size 26, which counts as “big” in the world of QAP. Around 20 years ago I wrote a very capable QAP solver, so I recompiled it and ran it on this problem – but didn’t let it finish. I am pretty sure it would take at least a day of CPU time to solve, and perhaps more. It would be interesting to see if someone could find a provably optimal solution! You can get the data for this problem, as well as a bit of Python code to experiment with, in this git repository. It’s easy to think up variants to this problem. For example, what about mobile phones? Other languages? Adding punctuation? Gesture-based entry? With QAPs, anything is possible, even if optimality is not practical. Rahul Swamy recently wrote about mixed integer programming and machine learning. I encourage you to go and read his article. Though Swamy’s article focuses on mixed integer programming (MIP), a specific category of optimization problems for which there is robust, efficient software, his article applies to optimization generally. Optimization is goal seeking; searching for the values of variables that lead to the best outcomes. Optimizers solve for the best variable values. Machine learning as a means for doing optimization. I want to put forward a third, but we’ll get to that in a moment. The thing you want to predict (the outcome). Things that you believe may influence the predicted variable (“features” or “predictors”). Train a model using the past data. Use the trained model to predict future values of the outcome. In these two relationships, one verb is used as a subroutine for the other: solving as part of predicting, or predicting as part of solving. then I can find the set of feature values that will increase sales as much as possible. The last step is an optimization problem. If the ML and optimization steps are separate, I can improve or change one without disturbing the other. I do not have to do the ML at the same time as I do the optimization. I can simplify or approximate the results of the ML model to produce a simpler optimization model, so it can run faster and/or at scale. Put a different way, I want the structure of the ML and optimization models to differ for practical reasons. In the machine learning world it is common to refer to data pipelines. But ML pipelines can involve models feeding models, too! Chaining ML and optimization like this is often useful, so keep it in mind. My last article showed you how to find an optimal tour of all 48 continental US state capitols using operations research. I used the Python API of the popular Gurobi solver to create and solve a traveling salesman problem (TSP) model in a few seconds. Create an input file for the problem you want to solve. Give the input file to NEOS, either through their web interface, or by calling an API. Let’s walk through those steps for the state capitol problem. If you just want to skip to the punchline, here is my code. Concorde requires a problem specification in the TSPLIB format. This is a text based format where we specify the distances between all pairs of cities. Recall that Randy Olson found the distances between all state capitols using the Google Maps API in this post. Here is a file with this information. Using the distances, I created a TSPLIB input file with the distance matrix – here it is. When I run this code, I obtain the same tour as in my initial post. Hooray! You can also extend my code (which is based on NEOS documentation) to solve many other kinds of optimization models. Randy Olson recently wrote about an approach for finding a road trip that visits all 48 continental US state capitols. Randy’s approach involves genetic algorithms and is accompanied by some very effective visualizations. 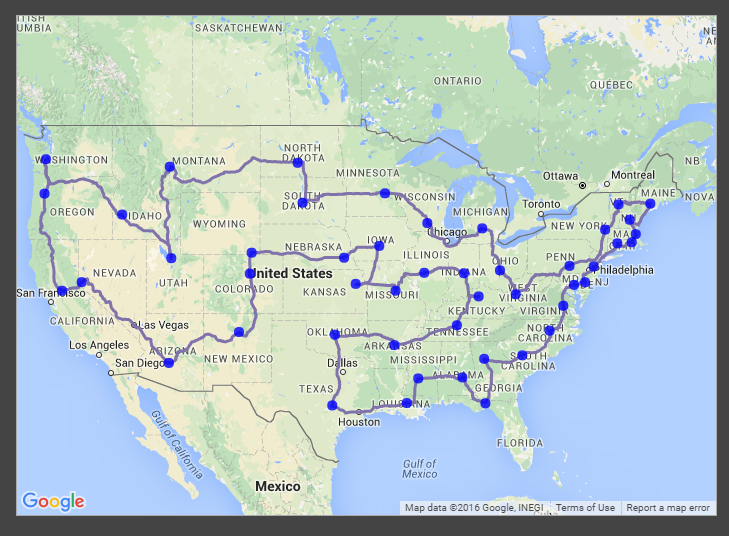 Further, he examines how the length of these road trips varies as the number of states visited increases. While the trips shown in Randy’s post are very good, they aren’t quite optimal. In this post I’d like to show how you can find the shortest possible road trips in Python using the magic science of operations research. I suggest you read Randy’s post first to get up to speed! The driving distance from capitol A to capitol B is assumed to be the same as from B to A. We know this isn’t 100% true because of the way roads work. But close enough. We’re optimizing driving distance, not driving time. We could easily optimize “average” driving time using data provided by Google. Optimizing expected driving time given a specified road trip start date and time is actually pretty complicated given that we don’t know what the future will bring: traffic jams, road closures, storms, and so on.. These aren’t “bugs”, just simplifying assumptions. 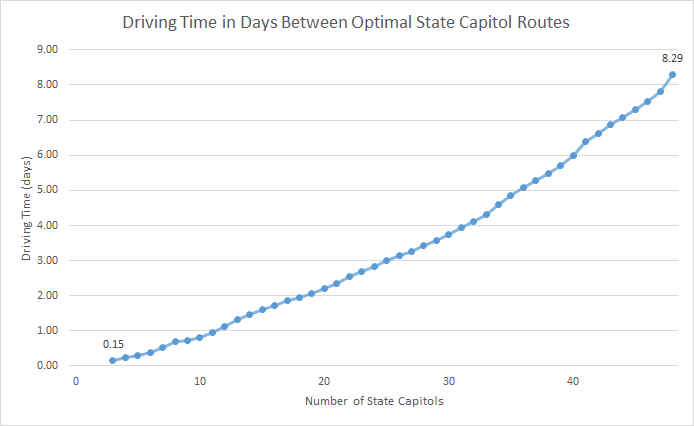 Randy used the Google Maps API to get driving distances between state capitols – here’s the data file. Note that Google Maps returns distances in kilometers so you’ll need to convert to miles if that’s your preference. Randy’s approach to solve this problem was to use a genetic algorithm. Roughly speaking, a genetic algorithm starts with a whole bunch of randomly generated tours, computes their total distances, and repeatedly combines and modifies them to find better solutions. Following the analogy to genetics, tours with smaller total distances are more likely to be matched up with other fit tours to make brand new baby tours. As Randy showed in his post, within 20 minutes his genetic algorithm is able to produce a 48 state tour with a total length of 13,310 miles. It turns out that we can do better. An inaccuracy in Randy’s otherwise great article is the claim that it’s impossible to find optimal tours for problems like these. You don’t have to look at all possible 48 city road trips to find the best one – read this post by Michael Trick. What we can do instead is rely on the insanely effective field of operations research and its body of 50+ years of work. In an operations research approach, we build a model for our problem based on the decisions we want to make, the overall objective we have in mind, and restrictions and constraints on what constitutes a solution. This model is then fed to operations research software (optimization solvers) that use highly tuned algorithms to find provably optimal solutions. The algorithms implemented solvers rule out vast swaths of possible tours in a brutally efficient manner, making the seemingly impossible routine. The shorter the total distance of the tour (which is determined by the distances between all of the “yes” pairs of cities), the better. This is the objective (or goal) that we seek to optimize. The traveller will arrive at each capitol from another capitol, and will leave for another capitol. In other words, exactly two decision variables involving a capitol will be “yes”. Tours don’t have cycles: visiting Boise more than once is not allowed. My code, based on Gurobi’s example, is able to find a tour with a total length of 12930 miles, about 380 miles shorter than the original tour. What’s more, it takes seconds to find the answer. Here is my Python code. 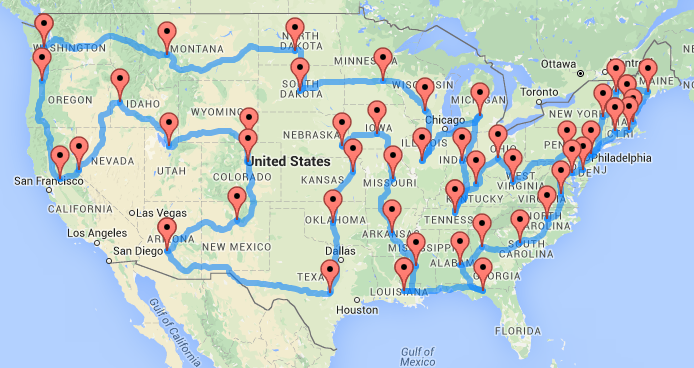 Here is the tour – click here to explore it interactively. An interesting twist is that Randy extends the problem to consider both the driving distance and the number of states visited. If we are willing to do a tour of, say, 10 states, then clearly the total distance for the tour will be much shorter than a 48 state tour. Randy has a nice animation showing tours of differing numbers of states, as well as a chart that plots the number of states visited against the estimated driving time. This curve is called the efficient frontier – you sometimes see similar curves in financial models. Introduce new yes-no decision variables for each capitol: “yes” if the capitol is one of the lucky K to be visited. Exactly K of the new decision variables should be “yes”. Fix up the original model to make sure we don’t worry about the other N-K cities not on our mini tour. The distances and tours for all of these mini tours are given here. What have we learned here? In about 200 lines of Python code we were able to efficiently find provably optimal solutions for the original road trip problem, as well as the “pareto optimization” extension. If you’re a data scientist, get familiar with operations research principles because it will certainly pay off! Through suitable rewriting such a specification could be easily sent to a solver. You get the idea; a range of problem types, and even concepts like warm starting are easily supported. I suppose even column generation could be supported via triggers. Update 10/1/2015: Friends Of The Blog Jeff, Alper, and colleagues thought of this long before I did. See this paper for more. I apologize in advance, and you’re welcome. Add your Tom Swifties in the comments! “Queuing theory says that the registration line will move faster if we all stand here,” Tom said optimistically. “Ah, but what did you expect? It was a grad student talking about Simplex at a sponsored session!” Tom pivoted. “Oh yeah, Gomory would positively rave over your choices,” Tom said cuttingly. “I don’t know the best way to the airport, but I can tell you what I did last time,” Tom said warmly. “I assure you darling, my derivatives are continuous in an extremely large neighborhood near the solution,” Tom said smoothly. “My model says that if I post this on a Tuesday, I’ll get more 20% blog hits,” Tom said analytically. “There may be some error in the data, but don’t worry, we’ve accounted for that,” Tom said robustly. “Just choose the largest slice and be done with it,” Tom said greedily. “Break the constraint if you want, but it’ll cost you,” Tom said softly. “I use Avogadro’s number in all of my big-M constraints,” Tom said unstably. “Things have never been better,” Tom said monotonically nondecreasingly. Dear Blogger: I am eight years old. Some of my little friends tell me that prescriptive analytics is just a fancy way to say optimization. My advisor tells me that if it is on your blog it must be so. Tell me, is it so? Optimization speaks to process and prescriptive analytics to purpose. [Numerical] optimization is finding the best option from a set of alternatives for a mathematical model. In more staid company it is called “operations research”. In less refined circles some simply speak of “search problems”, but this detracts from the majesty and beauty of the techniques that are so well-known and well-loved by practitioners. The theories and techniques of optimization date back centuries, though they were not labeled as such until much more recently. Optimization usually implies a formal mathematical model and a clearly articulated method that provides a guarantee about the quality of the alternatives are discovered. Prescriptive analytics implies a specific purpose – building a system that automatically produces decisions to choices that humans face. As a wise man once said: “begin with the decision in mind and see where it leads you“. In the practice of prescriptive analytics this may lead you down unfamiliar roads, but brainpower and software are always provisions for the journey. Software that lies at the center of data, models, algorithms, and computational platforms. Sometimes the job simply boils down to assembling data. Real time data, historical data, disjointed and incomplete data that must be joined, refined, summarized, synthesized and completed. Once this is done we are left with nothing but a measly linear program, or even more pathetically, a sort. There is no shame in this – there are no bonus points awarded for complicated formulations in the world of analytics. Prescriptive analytics concerns an entire process, and this process typically involves assembling data, building models, evaluating them, and presenting the results. Optimization comes into the play for the middle two steps, but the first and last are every bit as important. In fact, many times the first and last steps – assembling the data and presenting results in a form that people understand – are the most difficult and time consuming ones. And you do need tools to help you to pull them off. The problem with the analytics crowd, and the reason why optimization people sometimes roll their eyes, is that analytics people often focus entirely on the edges and ignore the middle: formulating and solving a real model. In prescriptive analytics we give all steps their proper attention, because without them the goal of delivering actionable plans for success cannot be attained. So, Virginia, this offers fantastic opportunities to those who choose to take up the challenge of mastering prescriptive analytics – young and old alike. A practitioner of prescriptive analytics needs to understand not only the formal methods of optimization, but much more besides. They need to understand how data is obtained, manipulated, and joined together. They need to understand the art of model building, which is experimental in nature and requires knowledge of the original problem domain. They need to be able to communicate the insights produced by their models in words and in pictures. Finally, they need to be able to understand the business objectives and motivations behind their projects, so that they can not only deliver what is being asked for, but anticipate (and answer) the questions that come next. Nathan Brixius Blog at WordPress.com.